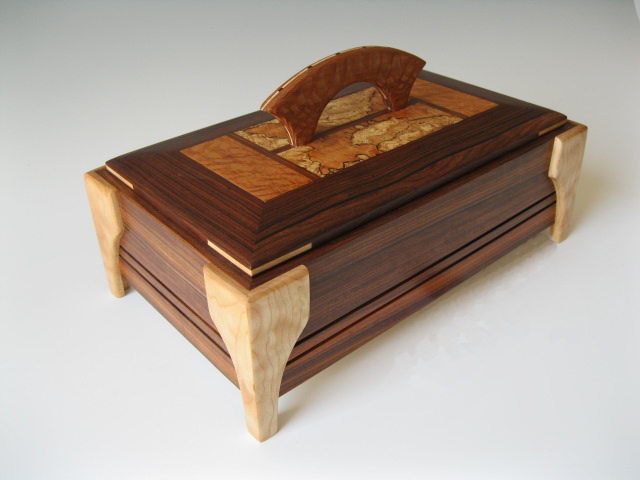 If you are looking for artistic wooden boxes, including beautiful handcrafted jewelry boxes, decorative keepsake boxes, or wooden cremation urns, then look no further. 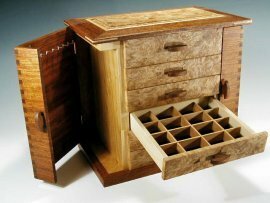 I have a wide variety of handmade wooden jewelry boxes and keepsake boxes, including boxes that make perfect unique gifts for men or women. These are my main designs; please click on each photo to see more pictures and learn more details about that particular box. 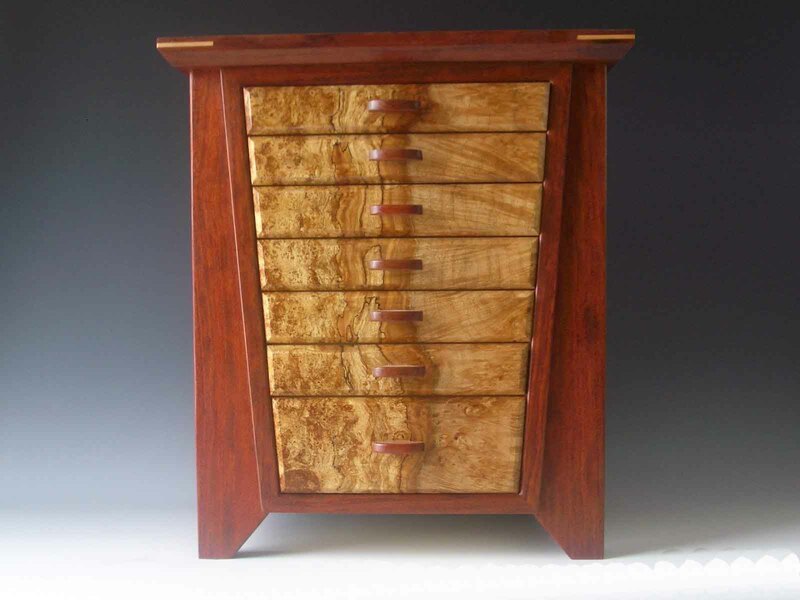 This design is called my "Swingdoor" and is one of my most popular boxes. It is designed to hold a wide variety of jewelry in the six drawers; plus the two side doors swing open and have hooks upon which you can hang necklaces. This is my Large Swingdoor; a slightly larger version of the Swingdoor. It is best for people who have a lot of necklaces; each side door swings open to reveal twelve hooks, and each hook can hold numerous necklaces. The Angle is another one of my most popular boxes, built specifically for those with a fair amount of jewelry or keepsakes. This armoire-style box can quite literally hold it all, plus have room to add more in the future. This decorative "Catch-All" Keepsake box is one of my more versatile boxes, especially if you're looking for unique gifts for men. It can hide away unsightly remotes, device chargers, keys, or anything else you don't want to see. The "Wedge" box is a great mens jewelry box or jewelry box for rings, earrings, and just about anything other than necklaces. The lid opens up to reveal two levels of storage, and the lower front drawer opens as well. 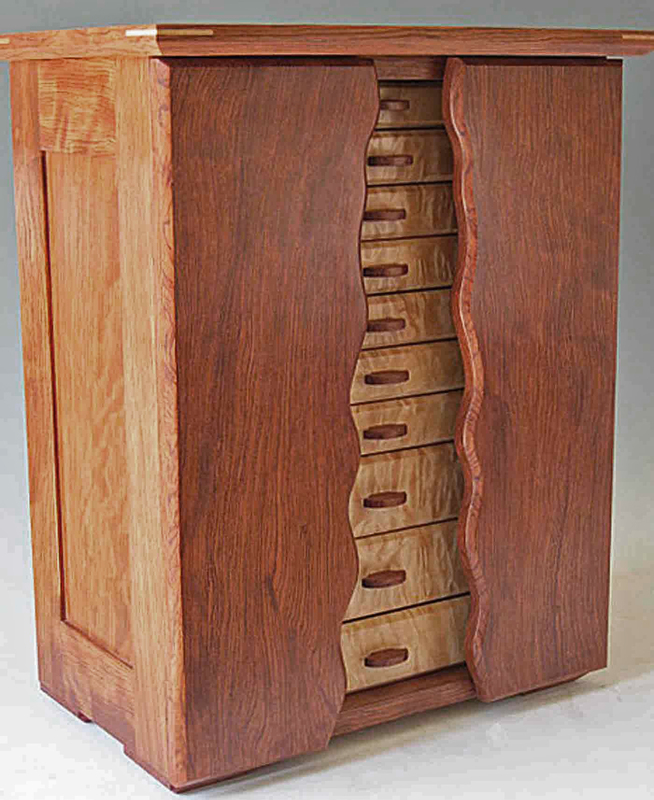 This armoire jewelry box, which I call "The Wave," is the ultimate of all jewelry boxes. This box is designed for the woman who truly loves jewelry, and wants a beautiful place in which to store it all. 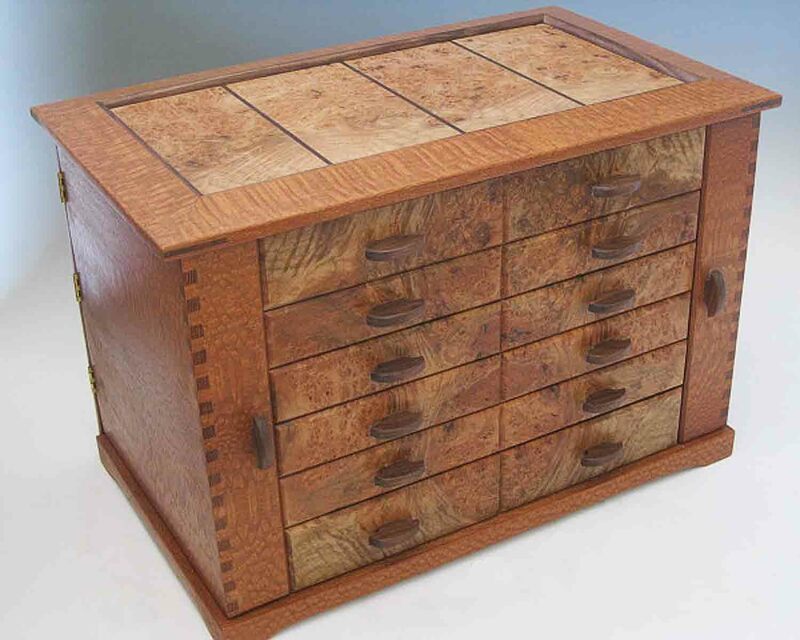 There are ten drawers, each with adjustable dividers to accommodate your jewelry. In each side door there is a slider bar that slides out, with eleven hooks for necklaces. 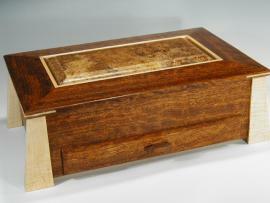 "The Bevel" is another versatile box, and can be used as a men's jewelry box or a watch jewelry box (with watch pillows). The lid opens to reveal two levels with sliding drawers, again with adjustable dividers. 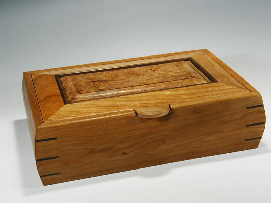 Each handmade wooden jewelry box, keepsake box, or urn is handcrafted by me, an award-winning artist from Colorado. I use exotic woods from around the world; and since no two pieces of wood are ever the same, you are getting a truly one-of-a-kind, unique piece that is as beautiful as it is functional. I never use any stains or dyes on any of my artistic wooden boxes; what you see are the natural grains and patterns that showcase the beauty of the wood. Each drawer in every handmade jewelry box contains adjustable dividers; enabling you to truly customize each box to fit your particular jewelry, watches, or keepsakes according to your needs. Once you decide upon a design, I will work with you to create your custom jewelry box or personalized keepsake box. I will send you pictures of your specific box to make sure it's the right one for you. When you buy one of my boxes, you know that you are getting a handmade piece of art created by an artisan here in the United States; not a manufactured, mass-produced item from China. These gorgeous handmade wood boxes make the perfect unique unusual gifts for men or women, and are a great way to treat yourself as well. Whoever receives such a rare piece is sure to treasure it forever. I purchased one of your Bubinga and Maple boxes about 4 years ago and still think it's as beautiful as the day I bought it. The craftsmanship is superb and leaves nothing to be desired. My wife loves the flexibility of it and everyone who sees it thinks it is simply stunning. Thanks so much for such a wonderful product. Just to let you know that my jewelry box arrived and it is stunning, I really love it! I looked at hundreds of them including store-bought (and probably Chinese-made), Amish/Shaker, and other hand-mades, and yours were the most beautiful (and the most versatile, as none of the others had adjustible drawer dividers). Thanks for the beautiful jewelry box, and I'm glad my holiday purchase was Made in the USA. Hi Steve, I just wanted to tell you that I have been having so much fun with my beautiful box, putting everything in one place (at last) and standing in front of it with the doors and a drawer open, admiring both the box and my lovely pieces. It sits in a place of honour in my bedroom; and has been much admired by my friends. Keep up the good work! 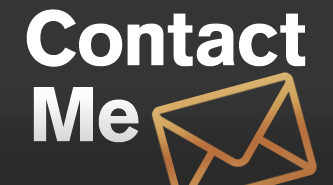 For more real-life testimonials from my customers, please click here to visit the Testimonials page.